Malina (second from right) with Theodore von Kármán during his work on JATO in 1941. Malina and his fifth WAC Corporal, October 11, 1945. Frank Joseph Malina (October 2, 1912 – November 9, 1981) was an American aeronautical engineer and painter, especially known for becoming both a pioneer in the art world and the realm of scientific engineering. Malina was born in Brenham, Texas. His father came from Bohemia. Frank's formal education began with a degree in mechanical engineering from Texas A&M University in 1934. In 1935, while a graduate student at the California Institute of Technology (Caltech), Malina persuaded Professor of Aeronautics Theodore von Kármán to allow him to pursue studies into rocketry and rocket propulsion. The formal goal was development of a sounding rocket. 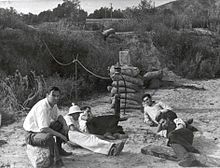 Malina and five associates (including Jack Parsons) became known at Caltech as the "Suicide Squad" because of their dangerous experiments (and failures) when testing rocket motor designs. Malina's group was forced to move their operations away from the main Caltech campus into the more remote Arroyo Seco. This site and the research Malina was conducting would later become the Jet Propulsion Laboratory (JPL). Malina served as the second Director of JPL. In 1939, the Société astronomique de France (French Astronomical Society) awarded Malina the Prix d'Astronautique for his contribution to the study of interplanetary travel and astronautics. In 1942, von Kármán, Malina and three other students started the Aerojet Corporation. By late 1945, Malina's rockets had outgrown the facility at Arroyo Seco, and his tests were moved to White Sands Missile Range in New Mexico. Here, the project's WAC Corporal sounding rocket was the first U.S. rocket to break the 50-mile altitude mark, becoming the first sounding rocket to reach space. Seated left to right: Rudolph Schott, Apollo Milton Olin Smith, Frank Malina (white shirt, dark pants), Ed Forman and Jack Parsons (right, foreground). Nov. 15, 1936. During 1947, with rocket research in high gear, Malina's demanding travel and administrative schedule, along with a dislike of so much rocketry research being devoted to weapons systems and not scientific research, caused him to re-evaluate his career and leave Aerojet. Malina's passing interest in the Communist Party and labor activism while he was a graduate student in the 1930s had also attracted the attention of the FBI. He moved to France and joined the fledgling United Nations as secretariat of the United Nations Educational, Scientific and Cultural Organization (UNESCO) under Julian Huxley. In 1951, Malina became head of UNESCO's division of scientific research. Two years later, Malina left UNESCO to pursue an interest in kinetic art. In 1952, at the height of the Red Scare, Malina was indicted for having failed to list his Communist Party membership on an old security questionnaire from Caltech. He was declared a fugitive, to be arrested if and when he returned to the United States. In 1968 in Paris he founded Leonardo, an international peer-reviewed research journal that featured articles written by artists on their own work, and focused on the interactions between the contemporary arts with the sciences and new technologies. The Leonardo journal is still published as of 2018[update] as a project of Leonardo/ISAST, the International Society for the Arts, Sciences and Technology. In 1990, Malina was inducted into the International Space Hall of Fame. Frank Malina died in 1981 in Boulogne-Billancourt, near Paris, France. His widow Marjorie Duckworth Malina died in 2006. Their sons Roger and Alan Malina live and work in France and Portugal, respectively. ^ a b c d "About Frank Malina". Leonardo/ISAST. 2016-10-04. Retrieved 2018-05-17. ^ The U.S. at the time used a definition of space as beginning at 50 miles' altitude, instead what would become the international standard 100 kilometers (62 miles). See Kármán line. ^ Johnson, James L. (August 2014). "America's Forgotten Rocketeer". IEEE Spectrum: 56. Retrieved 4 March 2018. ^ "Frank Malina, JPL Director, 1944 - 1946". JPL. ^ McCray, W. Patrick (February 1, 2016). "Rocketeer Frank Molina's Life as an Artist". IEEE Spectrum. Retrieved 4 March 2018. ^ "Review of "The Three Rocketeers"". ^ "Home". Leonardo/ISAST. Retrieved 2018-05-17. ^ Sheppard, David (September 27, 1990). "Slayton to Join Space Hall of Fame". El Paso Times. El Paso, Texas. p. 9 – via Newspapers.com. Wikimedia Commons has media related to Frank Malina. "Malina, Frank Joseph". American National Biography.